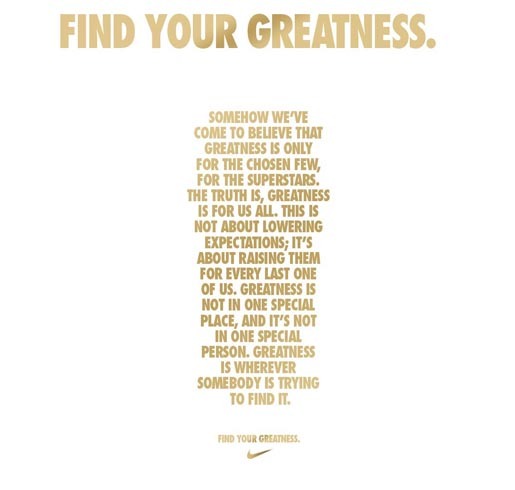 Nike is running “Find Your Greatness,” an advertising campaign focusing on the athletic greatness taking place in the Londons around the world, rather than at the 2012 Olympics in London, UK. Londoners of South Africa, Jamaica, Nigeria, the United States and other countries are showcased in one minute television commercial, as well as a series of sport-specific shorter films, to demonstrate that even if you play far away from the dazzle of the Olympics, your greatness isn’t any less important. 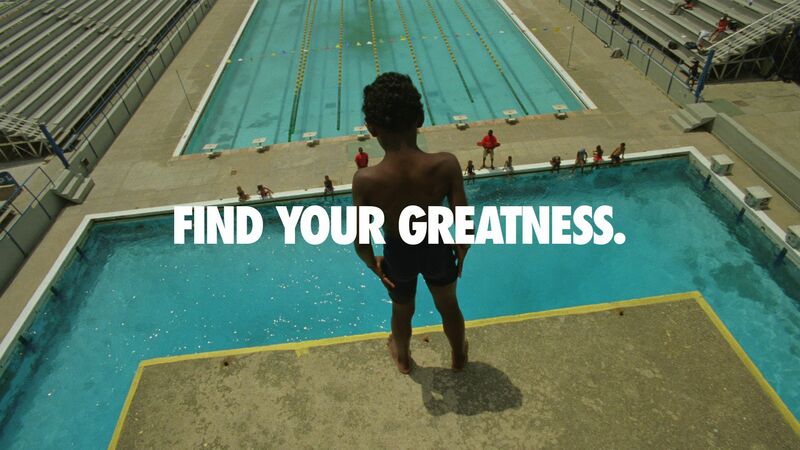 The campaign is being promoted with a global Twitter promoted hashtag, #findgreatness, designed to ignite conversation around how athletes everywhere find their own greatness. 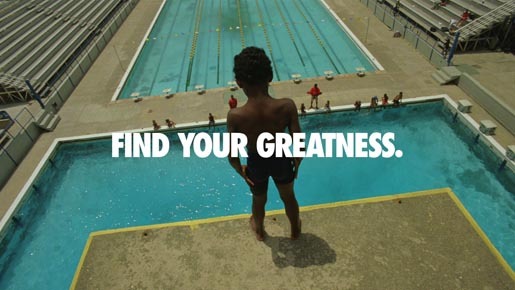 The Find Your Greatness film shows everyday athletes from around the world training, playing and competing, with the common thread that the locations featured are all called London. We first join a scene at “London Gym” where a man pumps out crunches during a workout, then go to a rugby match in East London, South Africa, where a boy breaks the line handing off a larger opponent. In Little London, Jamaica, a female boxer works the pads with consummate skill and precision. In London, Ohio, we see a close up of a focused young baseball player catch the ball and throw it to first base in one seamless action. While each athlete defines their own goals and success, they are all connected by a unifying sense of what greatness could be to them. How do you judge greatness when it comes to gymnastics? 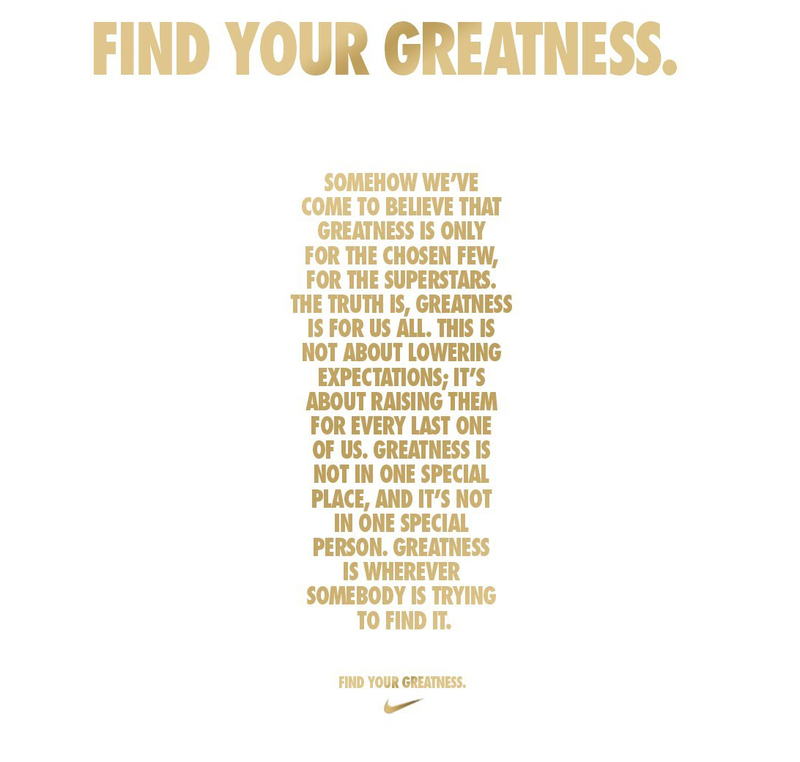 The Nike Find your Greatness campaign was developed at Wieden + Kennedy Portland by global creative directors Ryan O’Rourke and Alberto Ponte, interactive creative director Dan Hon, copywriter Brock Kirby, senior art director Sezay Altinok, art director Sara Phillips, senior agency producer Erika Madison, co-senior agency producer Jennifer Dennis, executive creative directors Mark Fitzloff and Susan Hoffman, agency head of production Ben Grylewicz. Filming was shot by directors Lance Acord and Seb Edwards via Park Pictures with executive producer Mary Ann Marino, director of photography Mattias Montero, line producers David Mitchell and Michaela Johnson, production supervisors Jason Groves and Lucy Glyn. Editors were Robert Duffy and Patrick Murphree at Spot Welders with post producers Patrick McElroy and Carolina Wallace, post executive producer David Glean. Visual effects were produced at A52 by VFX executive producer Jennifer Sofio Hall, VFX producer Scott Boyajan, 2D VFX artists Paul Yacono, Cameron Coombs and Andy Rafael Barrios. Sound was designed by Brian Emrich at Trinitite Studios, and mixed at Lime Studios by Sam Casas, Loren Silber and Dave Wagg with executive producer Jessica Locke. Music was composed by Nicholas R Wright. Music was produced at Search Party Music by Sara Matarazzo.